Gird your loins, chaps: the countdown is ON to the Mitsubishi Motors Badminton Horse Trials, and we, for one, couldn’t be more excited — not least because this year is a special one. 2019’s competition is the 70th anniversary of the inaugural Badminton, and since its first running in 1949 the sport, the venue, and the characters within this epic story have changed and evolved significantly. To celebrate 70 years of brilliant Badminton, we’re going to be bringing you an extra-special inside look at the event and its rich and exciting history, every week from now until the competition begins on May 1. Consider the archives your own personal Gringotts, and EN your loyal goblin sherpas. 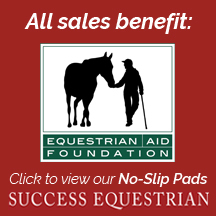 We all know – and, perhaps, take for granted – that the equestrian sports are that rare, progressive microcosm in which gender neutrality is a given and women compete on equal terms – and with equal success – as men. For this to be true of one of the toughest sports in the world, which requires such high levels of physical strength and fortitude, as well as relentless focus and unflappability, is doubly remarkable. Badminton made its auspicious debut in 1949, and in doing so, it created the atmosphere of equality – until that point, eventing had existed solely as a military sport, which meant that civilians and women weren’t allowed to partake. Although the competition was introduced as a training ground for future team hopefuls, the organisers opted to open the entry to anyone. In doing so, they levelled the playing field and left a legacy that continues to this day. In 2018, women won 50% of the world’s five-stars – take THAT, mainstream sport. Jonelle Price hefts the Badminton trophy, 64 years after the first female winner did the same. Photo by Tilly Berendt. Though we consider it a given that women are as capable as men, it’s important to remember that other sports – and indeed, many paths of life – aren’t nearly as progressive. Today, we’re looking back at those fearsome ladies who paved the way and proved that Badminton’s decision was the right one – the firestarters, the record-makers, the record-breakers, and of course, the mares. 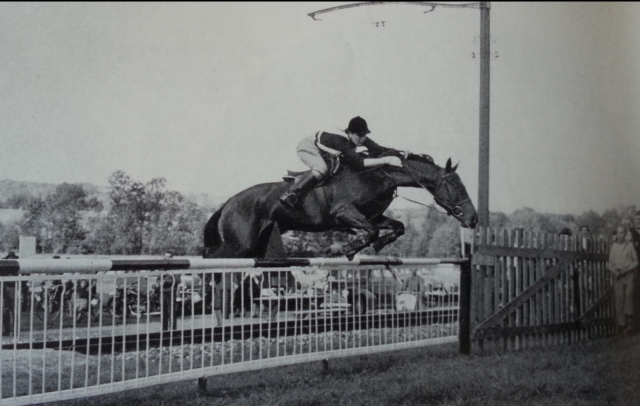 Anneli Drummond-Hay is widely considered one of the female trailblazers of eventing, and rightly so: she’s perhaps best known for winning the first ever Burghley in 1961 with Merely-a-Monarch, but the pair won Badminton too, taking the victory the following spring in 1962. They didn’t just edge the win, either – they led from pillar to post and finished 42 points clear of second-placed Frank Weldon and Young Pretender. Anneli was following in the eventing footsteps of older sister Jane, who was second at Badminton in 1951. 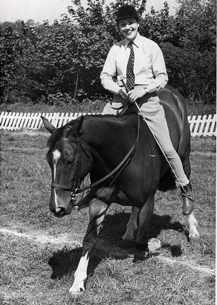 She had borrowed the ride on her sister’s horse Freya in 1955, standing in for her on the team at the Europeans so that her sister could get married, and from then on out, she was hooked. In 1960, she was third, and best of the Brits, at Badminton aboard Perhaps, a horse she’d bought from the slaughterhouse for £15. Anneli Drummond-Hay and Merely-a-Monarch – perhaps the world’s first truly remarkable event horse. Photo courtesy of Badminton Horse Trials. After Perhaps was bought by the Swiss team, Anneli went on the hunt for a youngster. She bought an advert in Horse & Hound, and although she was offered plenty of duds for sale, one response made her look twice. She was mailed a photograph of a two-year-old – a lovely stamp of a horse, she thought, but a year or two younger than she wanted. She forgot all about the horse, but a year later, the owners contacted her to ask if she could post the photograph back to them as they were still trying to sell the horse. This time, she decided to go and have a look herself. “I fell in love with him immediately,” she recalled. Merely-a-Monarch was ¾ Thoroughbred and a quarter Fell pony and just as classy as he’d been the year prior. Anneli borrowed the £300 purchase price and got to work with the talented, tricky youngster. By the time he was five, Monarch had won a horse trials at Tweseldown and had also been victorious at the Horse of the Year Show, winning the Foxhunter (1.20m) class, the show hunter division, and the combined training championship. He was just six years old when he won Burghley – and he was the only horse in the entire competition not to fall across the country. 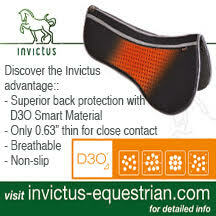 As part of her preparation for Badminton, Anneli sent Monarch to Ivor Herbert’s gallops for fitness prep. Because Ivor only allowed jockeys to use his track, Anneli had to sign the ride over for the day, and Monarch was sent out to gallop with Flame Gun, one of the most successful two-mile chasers of the time. Monarch outstripped the full Thoroughbred easily. After taking the Badminton title, Anneli was so worried about her beloved – and now extraordinarily valuable – horse getting hurt that she opted to switch to pure showjumping. 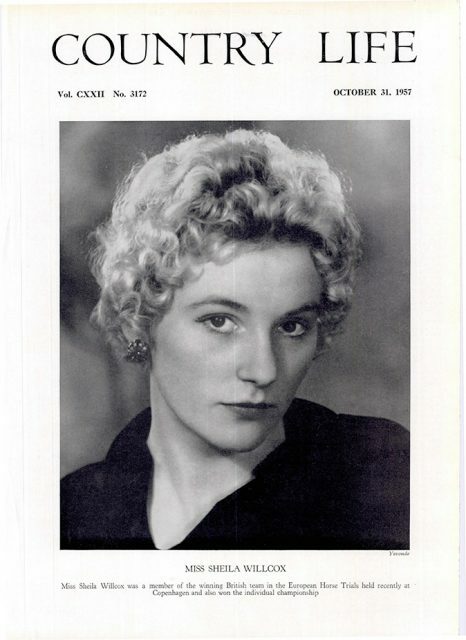 Women still weren’t allowed to ride on the eventing team at the Olympics, but had been let into the showjumping squad, and this was another enormous influence on Anneli’s decision. Although the pair had a great many successes together on the world stage – they were on five Nations’ Cup teams, came second at the 1970 World Championships, and won Grands Prix at Madrid, Toronto and Geneva – Anneli also suffered from attacks by the press. “I will always remember how fickle the press could be,” she said to Debbie Sly. “When I was third at Badminton on Perhaps there were a lot of very complimentary press cuttings saying I deserved a far better horse than the one I was on. But when I hit a few problems showjumping with Monarch there were more press cuttings declaring that this talented horse deserved a far better rider!” When Anneli was forced to sell a share in her horse to keep afloat financially, the shareholders, influenced by the negative press, insisted that the horse move to another rider. The matter was settled in court, and Colonel Tom Greenhalgh helped to resecure the share. Anneli retired Monarch from competition when he was sixteen and left him in the capable hands of his former groom, Merlin Meakin, who gave him a decade of fun out hunting. Anneli had moved to South Africa with her husband, but on a visit back to England, she received a call saying that Monarch had fallen whilst being shod and couldn’t get back up. “I was able to say goodbye before having him put down. I was always grateful that he ‘waited’ until I was home so that I could do that,” she reflected. 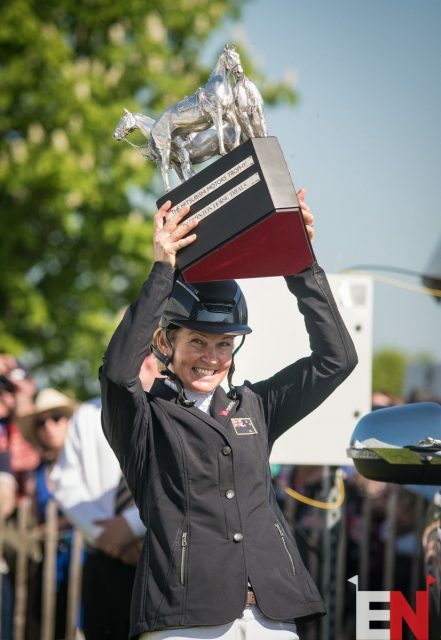 The Drummond-Hay legacy continues to dominate to this day – Jane’s granddaughter, and Anneli’s great-niece, is British eventing supremo Izzy Taylor. 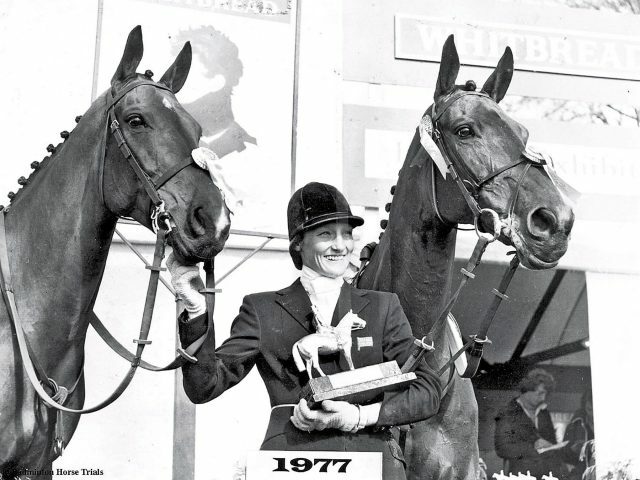 Jane Holderness-Roddam (then Bullen) took the Badminton title twice: her first win was in 1968 aboard Our Nobby, and her second came ten years later in 1978 with Warrior. With the latter, she also won Burghley in 1976, while the former was her mount for the ’68 Olympics in Mexico City, where Great Britain took team gold. Of course, multiple wins are almost commonplace these days, but Jane’s first victory was notable for a couple of reasons. First was her horse. Although Our Nobby has been written into the history books as being 15hh, which would tie him with Our Solo as the smallest-ever winner of the event. In actual fact, he may well have been smaller: Jane admitted after the fact that it was always a struggle to get him to measure up to the required minimum height of 15hh, and he had won several showing classes for ponies up to the height of 14.2hh prior to his major win. He was issued a life certificate for the Pony Club, which confirms this smaller height – whether he grew that final two inches, or whether he was standing on tip-toes for measurement is a historical uncertainty that only Jane would know the answer to. Jane Holderness-Roddam and Our Nobby. 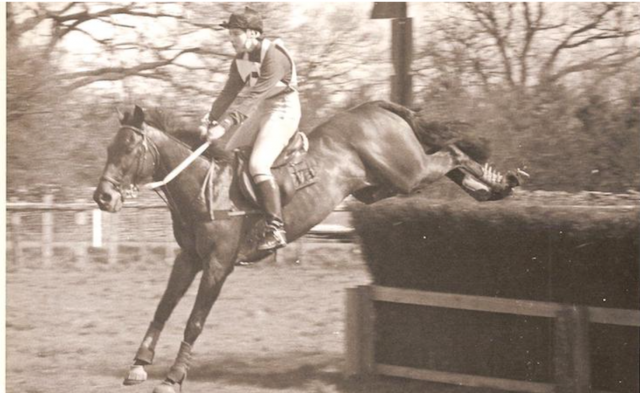 The full Thoroughbred gelding (Bewildered x Lady Sicily, by Happy Landing) had been sold to the Bullen family for £120 as a potential family pony – he was an athletic type, but simply hadn’t grown enough to be considered an adults’ mount. This was partly due to his premature birth – his owners were out of the country when he appeared, quite unexpectedly, and he very nearly perished in the harsh winter weather before a local blacksmith spotted him in the field and took him to the RSPCA. Though he tried his hand at racing as a four-year-old, he wasn’t considered a competitive prospect. He was passed along via a Welsh shepherd, contracted Canadian Pox, and ended up in his permanent home with the Bullens when he was a five-year-old, once again weakened and in a sorry state. However, once he settled into his new surroundings and enjoyed some of the Bullens’ hospitality – and good feed – he revealed his true colours. Nappy and tricky, he couldn’t be sold on. Jane’s older siblings Mike and Jennie rode him initially, and once some of the buttons had been installed, he was passed along to young Jane for use in Pony Club competitions. Though he was never a reliable first-phase performer, he was tough and quick across the country, and he and Jane tended to claw their way up the rankings by amassing the maximum possible bonus points for speed in the cross-country phases. 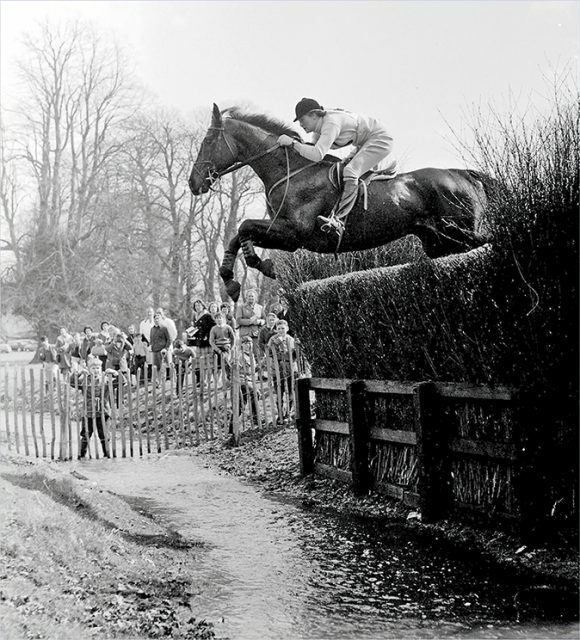 “He was as tough as old boots and speed was nothing to him; he was terribly fast and a fantastic jumper,” said Jane. Jane earned the nickname ‘the galloping nurse’ because, at the time of her first Badminton win, she was working full time as a nurse in London. In fact, the 20-year-old worked seven night shifts back to back leading straight into Badminton. Despite lack of sleep and the rigours of her stressful job, she achieved the maximum possible bonuses on Saturday and delivered the pivotal clear round on Sunday. It was exactly what she needed to win what was deemed in a year with the biggest field yet – 55 entries – and what was, at the time, the biggest and toughest cross-country challenge yet. 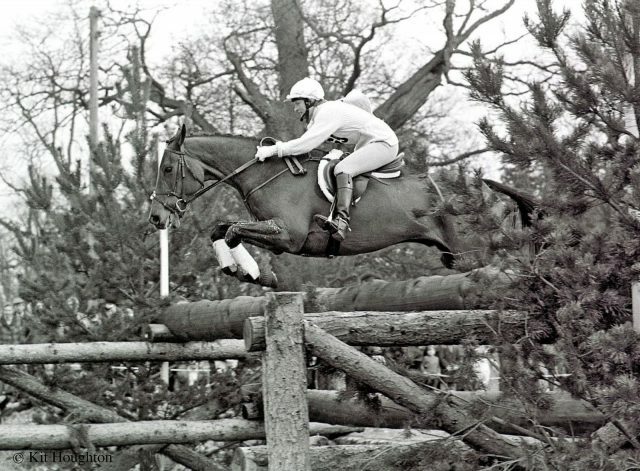 Though eventing hadn’t yet reached the peak of professionalism that it has now, it was still unusual for a Badminton competitor to juggle eventing alongside a full-time job – indeed, the only person to win with such credentials since was Captain Mark Phillips, who won while serving as an army officer. After Badminton, Jane went on to become the first women ever to win an Olympic gold medal for equestrianism. Since then, she’s been a hugely influential figure in the industry: she’s an FEI technical delegate and judge, has been the president of British Eventing, the vice-president of the British Horse Society, and a trustee of both the Brooke and World Horse Welfare Charities. She also served as a lady-in-waiting to Princess Anne and was honoured with a CBE by the Queen of England. At just 15hh, the diminutive Tramella was one of the smallest horses to compete at Badminton. But that’s not what made the Welsh pony x Thoroughbred mare so remarkable. 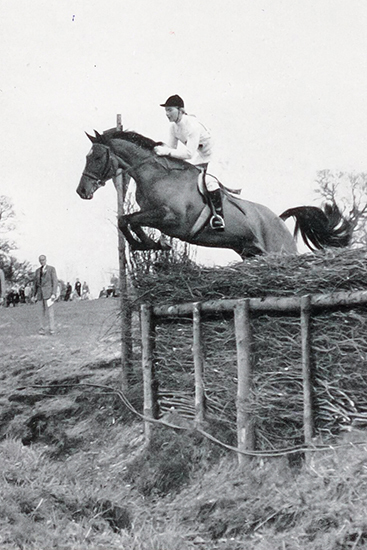 In 1954, Diana Mason and Tramella, by Tramail, finished third at Badminton. The winner that year was Margaret Hough (see #3) – the first ever woman to win the event. Later that year, both women would contest the European Championships, giving them the shared honour of being the first women to ever ride on a three-day-eventing squad. 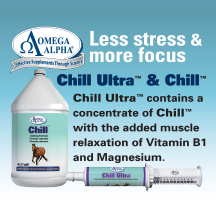 But Diana didn’t always expect greatness from her little mare. She came across Tramella – known as ‘Mell’ – as a four-year-old, and found her exceptionally naughty and nappy. Still, she climbed aboard for a trial ride, which required Mell’s then-owner to lead the recalcitrant youngster down to the far end of the field with Diana aboard. Once they reached it, the owner unclipped Mell and girl and horse galloped at full-speed back to the gate. That was as much as Mell was willing to do. Tramella shows off her party trick. Along the way, though, Mell was getting no easier to deal with. Her nappiness worsened after she managed to jump out of her field and onto the road. There, she slipped and gave herself some minor superficial injuries – and this just furthered her conviction that staying put on the yard was the safest way to live. Tramella’s famous over-fences rage face. Photo by l’Annee Hippique. Once Diana started to figure the mare out, the pair had lots of success in the show ring. 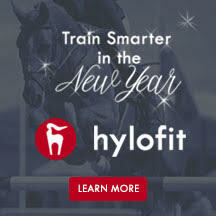 Pretty Mell, with her four white socks, even made it to the Horse of the Year Show, where she performed beautifully in all her classes – but it was her win in the combined training that made the biggest impact on her plucky young rider. Perhaps she, too, could make it to Badminton. 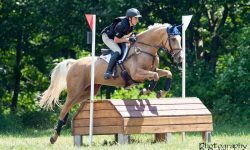 The following year Mell was a five-year-old and deemed ready to head out eventing. 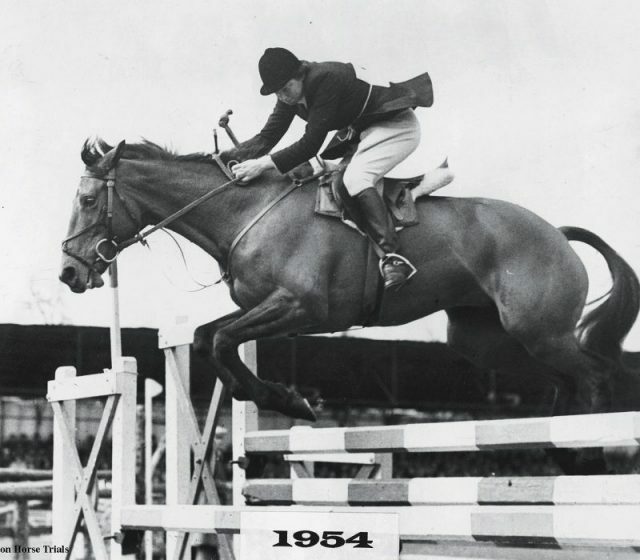 She won her second competition, finishing ahead of two horses that had been shortlisted for the ’52 Olympics. In ’53, as a seven-year-old, she made her first trip to Badminton. There, Diana discovered that her little mare’s mercurial nature didn’t exactly lend itself to dressage in an atmosphere – she refused to work in the furthest third of the arena by the grandstand. They finished 19th that year. The next year, Diana went back to Badminton with a plan of action. They warmed up for a whopping five hours before the first phase. This time, she and Tramella found themselves in second place after the dressage, and went on to finish third in the competition. Later that year, they’d make their history-making team debut at the Europeans, contributing to the team’s gold medal and finishing seventh individually despite a tumble on the flat on cross-country. They were duly selected for the Europeans again the following year, where they led after the dressage – but Tramella slipped on landing from one of the imposing cross-country fences and both horse and rider fell. For Tramella, this first ever fall had an enormously detrimental effect – she completely lost her confidence across the country. 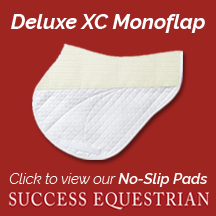 Diana decided to listen to her plucky mare and swapped her over to pure dressage. After teaching her flying changes with the aid of a training manual, the pair were competing prolifically at the Grand Prix level. At that time, Tramella was one of only a handful of horses at the level in Great Britain. Diana Mason and Tramella at their first European Championships. Photo by l’Annee Hippique. The pair would compete internationally multiple times in their second career, but it wasn’t until Diana had retired the mare to try to get her into foal – unsuccessfully – that she set her remarkable record. 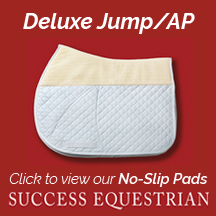 At 17, the mare was called up to represent her country at the Europeans once again, this time on the dressage team. 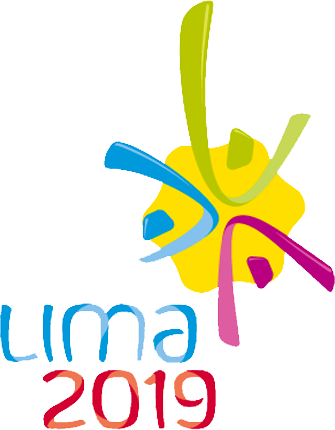 The team took gold, and Tramella and Diana remain the only pair to win gold medals in two disciplines. All this aside, our favourite thing about Tramella is that she had a special trick – she’d been taught to ‘curtsy’ for a lump of sugar. At Badminton, she would pull out that trick for anyone who walked past her stable – including the Queen of England, who was thoroughly charmed by the little mare’s impeccable etiquette. 1954 was a banner year for the girlpower contingent – it was at this iteration of Badminton, its sixth running, that the first female winner was crowned. Even better, she did it riding a mare. 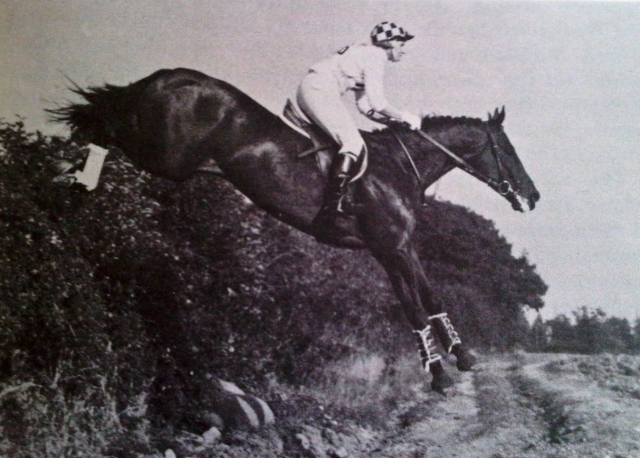 Margaret Hough was bitten by the eventing bug in 1951 when she took third place at Gisbourne with her future Badminton winner Bambi V (Long Walk x Dark Secret). Though it was only the mare’s second competition, she was talent-spotted by team hopeful Reg Hindley and Tony Collings, who asked Margaret if they might borrow the mare for the squad to use. Though this sort of horse-swapping was commonplace in those days, Margaret wasn’t initially convinced. Eventually, she came round to the idea, thinking that even if she could never ride at the Olympics, perhaps her horse could make something of herself in Helsinki. The one condition she named was that she would get to accompany her mare as her groom. Margaret Hough and Bambi V take Badminton. Photo from the Badminton Horse Trials archives. In the end, Bambi did go to the Helsinki Games, but she was the reserve and wasn’t called up. The following year, 1953, saw her stay with the team, and she was piloted by Bertie Hill in the Open European Championships at Badminton. They finished seventeenth individually and contributed to the British team’s gold medal. With a newly-minted Badminton horse on her hands, Margaret thought it was high time she had a go at this elite competition herself. “I was determined to do my best, though I never really thought that would be good enough to win,” she recalled. Her best was certainly good enough to put the pair into the lead after dressage, though, and they set out on Saturday’s speed and endurance phases feeling full of running – so much so that Bambi, who was renowned for jumping with her ears flat back against her head like some sort of rage-fuelled Ferrari – tried to jump one of the waters in one go. Interestingly, though the duo went on to win, they did so with a black mark against them on the cross-country – they had a stop at the Luckington Lane crossing. Their win was thus marred by some controversy – there were many who felt that second-placed Frank Weldon and Kilbarry had been mistimed in the steeplechase and not given the correct bonuses, and still more who felt that his two rails down on the final day shouldn’t have been more heavily penalised than Margaret’s stop across the country. A lengthy – and rather familiar – debate followed about which of the phases should carry the most influence on the competition as a whole. That debate would rage on for another 23 years before the penalties for a knocked rail were reduced from 10 to 5.
not ONLY found in She Who Rides! and bring the Germans near to tears. who this, and doubtless more, could do. are nerves, curves, and a pretty face! Thanks for the clarification re: the Swiss, chaps – was rather concerning otherwise. Margaret died at the beginning of 2018 at the age of 86 after suffering a chest infection. 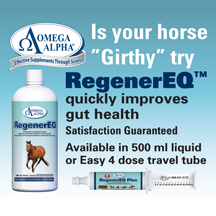 This was the final battle in a lifetime of respiratory issues – in fact, it was due to chronic bronchitis as a child that Margaret began riding on the recommendation of the family doctor. Despite her incredible legacy, the late Sheila Willcox wasn’t born into a remotely horsey family. Instead, she once described her household as being “entirely suburban, based on business and academic careers and given to rugger, tennis, and bridge-playing.” Nonetheless, she was inexplicably bitten by the horsey bug, and spent her formative years saving up her pocket money so she could afford pony rides along the beach on holidays. Her parents eventually defected, and she was allowed to join the Pony Club. This, of course, swiftly became the primary focus of her life – so much so that her unwitting father bought her an unbroken pony in order to persuade her to head back to school without a fuss. Sheila was only ten years old at the time but nevertheless, she set about the great new challenge of training the two-year-old ‘Folly’. A successful junior career riding show hacks followed, after Sheila’s parents deemed showjumping rather too unladylike to be proper. 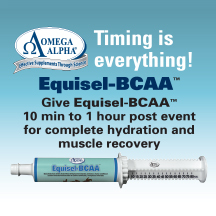 But Sheila wanted more of a challenge and, at the age of seventeen, she came across the sport of eventing. Like many profoundly bonkers teenage girls thereafter, she was instantly committed, and set about on the hunt for a horse that she might be able to turn into an eventing star. Eventually she found that horse in the form of High and Mighty, or ‘Chips’, a seven-year-old dun by a Thoroughbred stallion and out of a Highland pony/Arab-cross mare. Though neither horse nor girl had any real formal training, Sheila undertook the job with aplomb, consulting a well-worn copy of Dressage by Henry Wynmalen for guidance. They won on their first attempt at eventing, in a Novice (Prelim) class at the now-defunct Hovingham Hall Horse Trials, and the British Horse Society got in touch to suggest that, down the line, Sheila might consider lending the horse to the British team for use at the Olympics. And here we get to the crux of what really makes Sheila’s legacy so remarkable: she paved the way for women when the sport, though still refreshingly genderless in most spheres, only catered to men for Olympic berths. Impossibly glamorous and relentlessly fierce, Sheila refused to bow down to the whims of the BHS, and she rode as though she had a point to prove – perhaps because she did. As one of eventing’s suffragettes, she made it clear that the ‘lady riders’ could play with the big boys – and she did so by setting a remarkable Badminton record that no one has yet beaten. In 1955, she began training with Colonel Edy Goldmann, who was one of the first British trainers to promote a German-style focus on dressage. Paired with Sheila’s single-minded competitiveness, the result was formidable, and after a good showing at Harewood Horse Trials, Sheila and Chips were offered a place on the British team at that year’s Turin International. Sheila was the only female rider in the competition…and she won it. 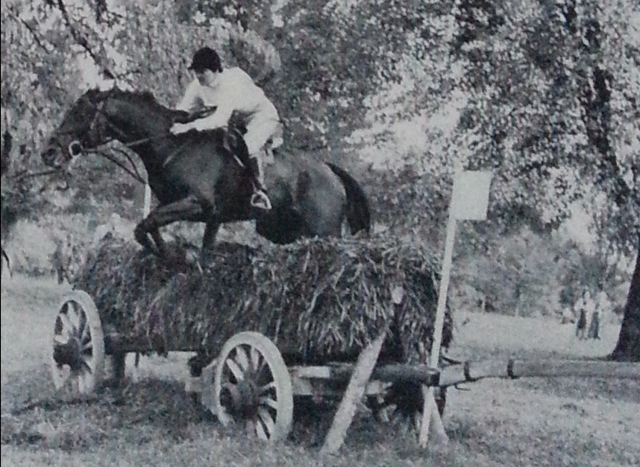 In 1956, after just a year and a half of eventing, she and Chips headed to Badminton. 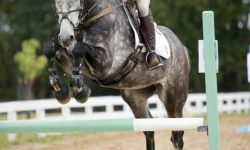 They were placed second after the dressage, and accumulated the maximum number of bonus points in the speed and endurance phases, but even their clear showjumping on the final day couldn’t push them ahead of the legendary Frank Weldon and Kilbarry. They retained that second place all the way through until the bitter end – and overnight, British selector Ted Marsh had bought the horse on behalf of the team. As consolation, Marsh promised that if Chips returned from that year’s Stockholm Olympics in one piece, Sheila would be allowed to take him to Badminton the next year. 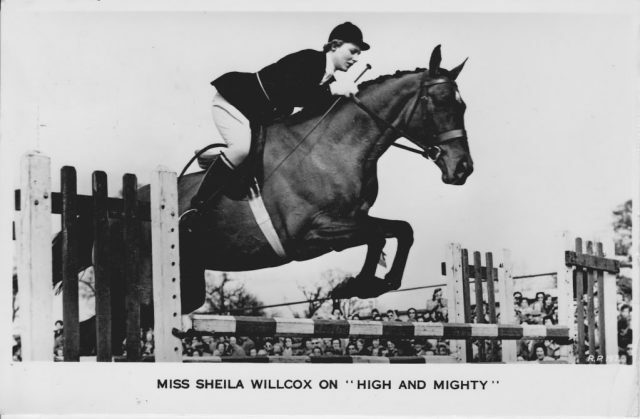 Sheila Willcox at Badminton. Photo by Badminton Horse Trials. After the Games, Sheila was able to buy her ‘lame’ horse back from the team. He promptly came sound again, and they won their ’57 Badminton prep run. Then it was time to head to the main event, made doubly special by the fact that Sheila’s 21st birthday fell on cross-country day. Fortunately for her festive spirit, she and Chips found themselves in the lead after dressage and, with a fast clear under their belts, still at the top of the pack by the time her party began at a nearby hotel. The crowning glory of the party was her colossal birthday cake – it was made to look like an elaborate cross-country course, with 21 fences artfully constructed along the top. Around them was a castle, some streams, and some carefully constructed terrain – and, of course, a tiny replica of Sheila and Chips popping over the final fence. By all accounts, the party was a roaring success. At 3am, Sheila had to forcibly remove the revellers so she could get some sleep – but in true eventing fashion, she was able to get the job done the next day. The Badminton title was hers. The next year, the remarkable pair took the crown again. 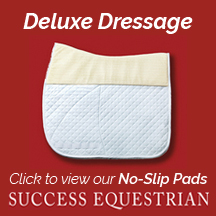 This time, they would do it by the widest margin ever seen to date or since – they led the dressage by 22 points and ultimately won an astonishing 47 points clear of the next competitor. That autumn, Sheila and Chips headed to the European Championships in Copenhagen, and won both team and individual gold – this made Sheila the first woman ever to win the Europeans. Afterwards, Sheila gave High and Mighty to Ted Marsh to ‘retire’ into the Heythrop hunting field, but nevertheless, she was able to continue her quest to be the very best. The seven-year-old Airs and Graces had only been eventing for six months by the time he headed to Badminton in ’59, but he won it easily, giving Sheila the last of her unrivalled three consecutive wins. In 1964, she took a fourth title, winning ‘Little Badminton’ – a separate class run over the same course but for horses with minimal winnings – with Glenamoy. Sheila Willcox and Chips. Photo from the Badminton Horse Trials archives. 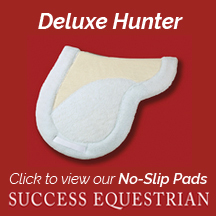 In 1971, Sheila suffered a catastrophic fall at Tidworth Horse Trials, and was left partially paralysed. 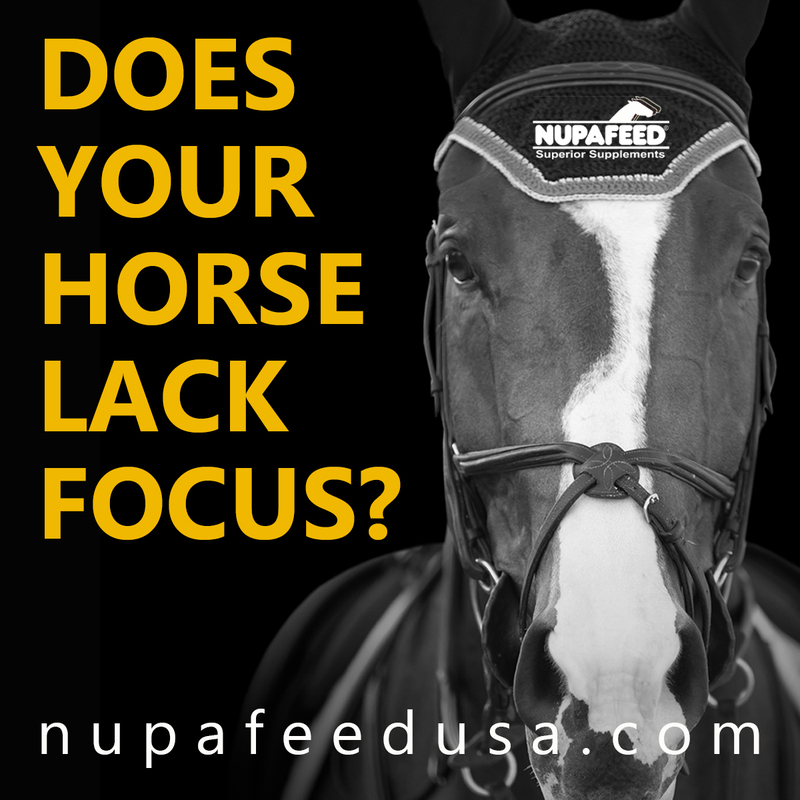 Determined not to give up riding, she swapped her focus to pure dressage and went on to compete successfully at the Grand Prix level. But she was also an enormously influential figure to the next generation of event riders: one of her rare and notable students was Mary King, who worked her way up to being Sheila’s head girl. As it turned out, the ferocity of spirit and determination that made Sheila such a formidable competitor made her a notoriously tough employer and trainer, too. Lucinda was just nineteen when she took her first title in 1973 riding Be Fair, her Pony Club eventer who had taken her to team gold at the ’71 Junior European Championships. Be Fair was out of a mare called Happy Reunion, but he wasn’t planned progeny – in fact, he was borne out of an illicit liaison between the supposedly barren Happy and her field companion. The guilty colt in question would go on to contest Badminton himself – he was Fair and Square, ridden by Sheila Willcox. Despite the nosebleed – and a runout at the walls as a result of her slippery leather gloves – Lucinda finished fifth. 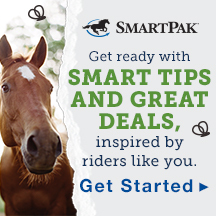 The following year she and Be Fair would return, and this time, they’d produce a nearly foot-perfect round – just one minor reroute due to an erroneous lack of martingale marred their cross-country, but they escaped penalty and took the title. In 1976, Lucinda took her second Badminton title, but her victory was arguably superseded by the tragic death of her mount, Wideawake. 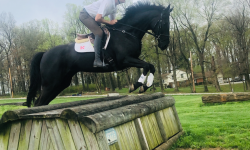 The 16hh gelding (Hereward the Wake x Serenade) had been a tricky character, and Lucinda had poured all her energy into building a partnership with him. In winning Badminton, it seemed as though all the hard work had come good – as Lucinda put it, “I had finally learnt to ride him as he needed to be ridden.” That required doing as little as possible – Wakey didn’t like to feel even the slightest nudge of his rider’s legs, but instead wanted to be left alone to work things out for himself. As the pair waited to begin their lap of honour, Lucinda leant down to hug her mount’s neck. 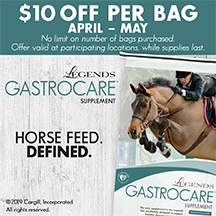 While she did so, the rest of the top-placed horses and riders duly filed out of the arena in order to allow Lucinda to begin the victory gallop alone, as was customary. Just as the final horses were leaving the arena, Wideawake reared up without warning, staggered a few paces, and fell to the floor. He was pronounced dead shortly thereafter, and the cause was never ascertained. The following year, Lucinda was back with a bang riding George, the 16.2hh grandson of 1948 Grand National winner Sheila’s Cottage. Though he looked the perfect stamp of an event horse, his competition record was so peppered with falls that Lucinda nearly turned down the ride. But her father had reached the terminal stages of his cancer diagnosis, and life in the Prior-Palmer household was a pretty morose affair, so her parents encouraged her to take the horse on as a welcome distraction. He arrived just a matter of weeks before Badminton and promptly went lame. 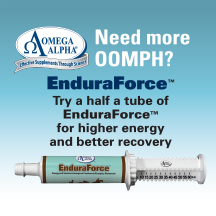 Lucinda managed to get him back on the straight and narrow with just enough time to run at a one-day event as practice. To her own great surprise, they won it – and Lucinda began to wonder if she should aspire to more than just survival at their big outing. She changed her mind swiftly upon starting the second phase. Although George had performed well in the dressage to sit fourth, he set against her hand in the steeplechase and ploughed through most of the fences. But while Lucinda was losing faith, her support team wasn’t – her father even insisted on leading the horse around in the ten-minute box. “It was their optimism and belief that finally shook me out of my own depths of despondency,” Lucinda recalled. Lucinda Prior-Palmer and George, right, enjoy their win. Photo courtesy of Badminton Horse Trials. George responded in kind. As they set out onto cross country proper, he came into his own, jumping around faultlessly to finish within the optimum time and go into the lead. That Sunday was St George’s Day and, as though in recognition of the fact, he jumped yet another foot-perfect clear to secure a third victory for his rider. That autumn, he contested the Open European Championships at Burghley, winning both team and individual gold, and was retired to the hunt field shortly thereafter. Lucinda’s father passed away in the months following her Badminton victory. Lucinda’s fourth victory came aboard another horse she considered an unlikely champion. Killaire wasn’t naturally fast, and he tended to be a long and low type of horse. But he had managed to finish second at Burghley in 1976, third at Badminton and Ledyard in 1977 and, as Lucinda had been pipped at the post and ‘only’ finished second at Badminton ’78 with Village Gossip, it was felt that it was high time for another triumphant effort. In ’79, Killaire offered just that, digging exceptionally deep to make up the seconds across the country and just beating Sue Hatherley and Monocle, a defeat that Sue never quite got over. Killaire and Lucinda Prior-Palmer. Photo by Kit Houghton/Mitsubishi Motors Badminton Horse Trials. Lucinda, for her part, went on to write a book called Four Square, which chronicled her four wins and four remarkable horses. Quite understandably, she assumed she’d put a cap on her winning by now, and described her ’79 victory as “drawing the fourth and final side, and thereby closing an unbelievable square.” Joke’s on YOU, Lucinda. 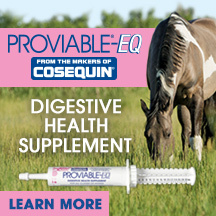 “He had an incredible jump, but did everything with his head in the air – he was so ewe-necked that when he galloped along his ears were in your mouth,” said Lucinda of her ’83 victor, Regal Realm, who I’m sure many of us know best as ‘the horse with the really good stats in Equestriad 2001’. It was fitting, really, that Lucinda should triumph again in this of all years – after all, it was director and designer Frank Weldon’s 70th birthday, and he had created a track that would truly test the mettle of the most experienced and savvy cross country riders. Despite a proliferation of alternative routes for less experienced competitors, who wouldn’t mind adding on a fair chunk of time in exchange for surviving their round, only nineteen pairs recorded clears. Weldon was stumped, and Lucinda laughed her way to the top of the podium once again. After an illustrious career as a team stalwart and medal-winner, he was sent home to Australia to enjoy a sunny retirement, and died at the age of 21. Though Lucinda harboured some hope that she might notch up one more win – “seven is my lucky number,” she laughed – she never quite managed it. Now, she remains a familiar face on the circuit as a trainer, media mainstay, mother of five-star rider Lissa, and as a competitor herself. Long may the Queen of Badminton reign on!